Rated 4 out of 5 by rosekaufmann from LOTTA FUN Played the original a lot when it came out. This is more of the same. The folks keep messing things up after the area has been cleaned so the housework seems to never get done! Best to start gathering the laundry as soon as you're in the door and hope you don't miss any. Should be more of a live-in housekeeper - they can't even make dinner. Lots of fun. Recommended for anyone who likes TM games. Rated 4 out of 5 by gameluv_26 from super fun i really like this game. great way to learn to multitask. as soon as i won the game i started it over again. Rated 3 out of 5 by Delolo7 from Love it BUt... I love these kinds of games...its alot of fun...BUT...as others have stated you cant See the levels on a map and you cant redo the levels like in most time management games...I also didnt like that I couldnt buy what I wanted from the upgrades...just what the game offered...makes it very limiting. 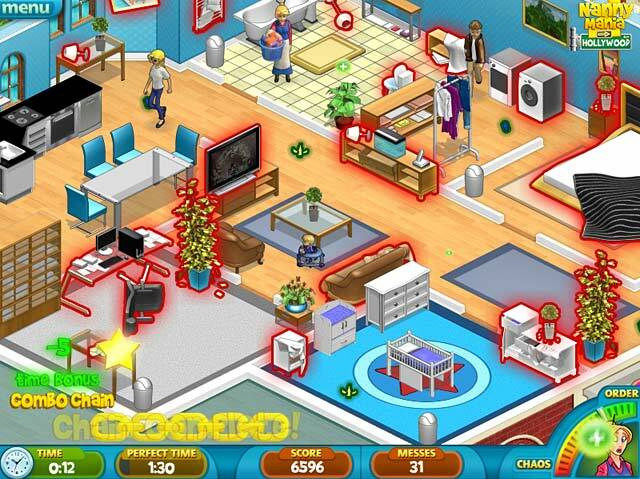 Rated 3 out of 5 by absfrank from Nanny Mania 2 Review The game is meant to be repetitive and to add to the repetition as you go. I don't like that the levels can only be seen while I'm in the middle of playing, not when I begin, each time. There is no redoing a level after playing it, you'd have to start all over again with a new game-you can stop it before the level is through, to replay. The items that should be available for 'purchase' to assist in game play, per level, so far are not available even with perfect scores. It is difficult to give an applicable age group as it would very much vary for each person's ability and view of what is fun although there is nothing I see as inappropriate for younger players. Rated 3 out of 5 by Gamer5302 from Repetitive Fun at first, then gets repetitive and boring. There is no level map, so you have no idea where you are in the game, and you can't replay a level. Instead of gradually increasing the amount of challenge, time and difficulty for each level are completely random, where you get 5 min to complete 20 tasks, and then the next level you get 1.5 min to complete 40, and it goes back and forth for the entire game. Rated 3 out of 5 by wolfie3061 from Boring I didn't like that there was no redo button. You have to stop before the level ends to go back to the main menu and if you didn't get the expert score there was no way to go back and achieve it. Same moves over and over. Rated 3 out of 5 by VampVivi from It was okay This game would be best with a mouse or touch pad. I didn't use neither, so it was difficult for me to play this game, but it was fun though. The crying babies were annoying though, not like I am against crying babies, I love babies, it's just it was annoying in the game. 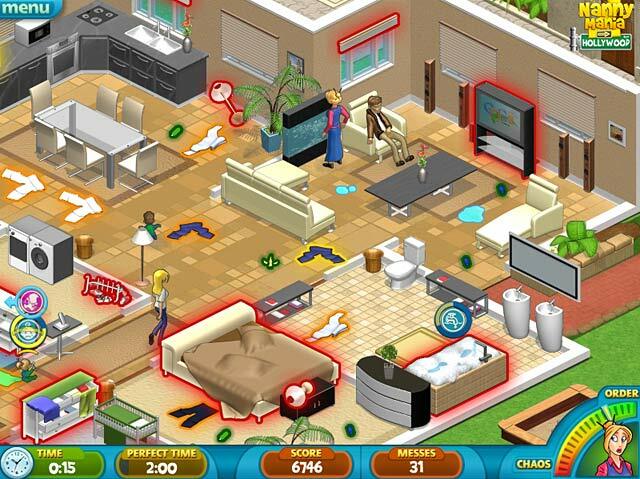 There's really no storyline in this game, you're just a nanny cleaning things as possible. Picking trashes, laundries, mopping the floor, vacuuming the floor. There's a combo chain if you only pick up the trash straight, they're so small that sometimes you can miss it and break the chain. I guess I would recommend this game, but I wouldn't buy this game. The quality of the game didn't suit my taste. Rated 3 out of 5 by Kheldar633 from A bug stopped me from buying it. I wish there were more time-management games in this style since I really enjoy them. I did not end up purchasing this title, however, because whenever you play it (Windows 7 64-bit) it resets the sizes of your windows in the O/S to its resolution. This is very annoying and is a game-breaker for me. Otherwise, it's an excellent title. Rated 3 out of 5 by GameplayerMiley2 from "Good game, but poor standards" This game is fun and free via big fish games for 1 hour! After just playing this game for the duration of the hour, there are some things i would like to point out before i started playing. It downloads first, then you have to go to big fish game manager and download it again! i am not sure about anyone else but mine took a while to download, in the game manager and installing it took even longer. It did take about a hour to download for my pc, and ten minutes longer while installing. Although this game is very enjoyable, it has some poor standards in the build up to playing the game. So i guess, i would recommened it, only to people who really set there mind to it and dont mind waiting a while for it to download. For others i would recommened the free trial first and then see how it goes on from then!!! Rated 3 out of 5 by wrinwick from Great game but... I love the Nanny series but this one ran far too slow. Thus making it impossible to get through the first level. 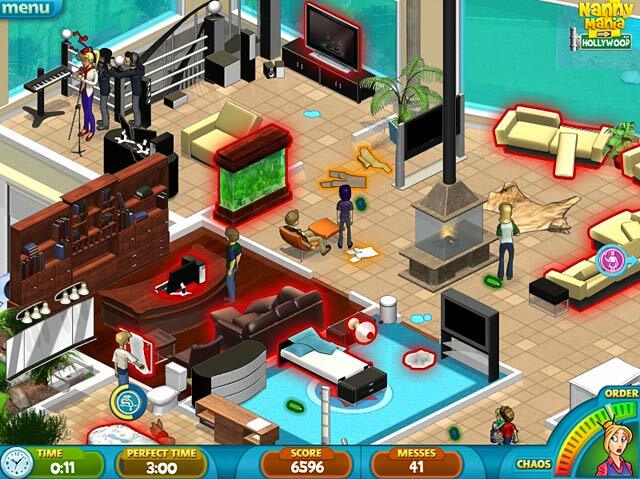 Rated 2 out of 5 by gold111z from Boring and tedious I was very disappointed in this game. Graphics and story line were good but the game was completely easy. Not only was it not challenging, you had to do the same things over and over again. I kept waiting for the game to end. Do not buy! Rated 1 out of 5 by catbag8717 from Left Wondering How A Game Like This Was Even Allowed On Here! This game is so boring and so dull that I wonder how it was let on BFG A terrible storyline with very dull, boring voice-overs that sounded like the actress just couldn't be bothered Absolutely terrible gameplay, all you do is go around cleaning the house, doing washing etc. Not even remotely interesting, very repetitive, quit almost as soon as I started Very bad graphics that need to be updated as soon as possible. 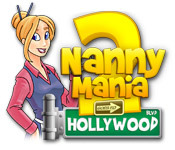 I so desperately hope that they NEVER make a Nanny Mania 3, so it will save us from the boredom.